Read all about our old friends the Unione Ticinese celebrating their 145th anniversary. 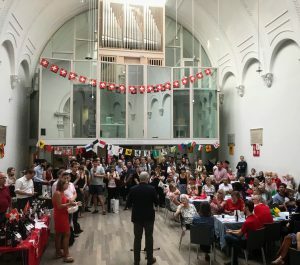 They are the oldest surviving Swiss community group, and represent the Swiss Italian community in London. We thank our friends Rita Day and Peter Barber. Don’t forget to read the feature on Jeffrey Long, 87 years old, and his remarkable fundraising achievements. Jeffrey is a long-standing friend of the Swiss Church. Have a look at our own article too, and find out what we’ve been doing as well. Finally , a special thanks to Gioia Palmieri , editor of the Swiss Review UK and Ireland, for another great issue.